Earlier I had posted about "Validate phone numbers using jQuery" but that code just validates for valid input, it doesn't check for format of phone number. But recently a jQuery plugin named "International Telephone Input"is released which validates all the international phone numbers along with country code. 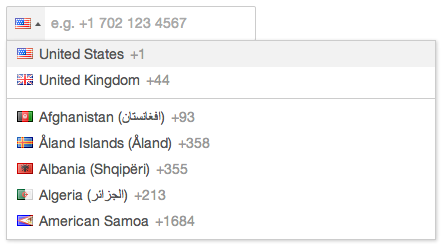 International Telephone Input jQuery plugin for entering international telephone numbers. It adds a flag dropdown to any input, which lists all the countries and their international dial codes next to their flags. To use this plugin, all you need to do is to download the latest version and then link the required stylesheet and reference to plugin library. This jQuery plugins also provides options for customization like for setting default country, dial code delimiter and many more. You can visit the official website for more information.